We’ll find out together what this is all about . . . So many of my friends have mentioned they are starting the New Year off being sick in bed! Well get yourself better fast, boys and girls! We have a brand new year to create! Since I am not the “Aw, poor thing” sympathetic type, I thought I’d instead offer a recipe for the best throat soother I know. I have used this for years ever since my children were little. Since it’s not an “over-the-counter” product full of unpronounceable ingredients in a box covered in cautions and warnings, this throat soother is fine for just about anybody. The star ingredient is the kumquat–that cute, tiny, oval orange citrus fruit that comes to market about this time of the year. Kumquats come from an evergreen shrub that grows in the Asian-Pacific region and have been used for centuries to make throat-soothing teas and remedies. My version has no added sugar or honey. Instead I use organic unfiltered apple juice. You may as well make a bunch of it because it takes all day. But once you’ve got it made you can store this in a jar for several months. Thoroughly wash the kumquats removing any stems and leaves. You will use the entire fruit, peel and all. Put the kumquats in a heavy pot and add the apple juice and sea salt. Bring this to a boil, turn down the heat and simmer it with the lid on. Simmer this for eight to twelve hours. If the liquid cooks away and your kumquats are not extremely soft and you don’t have gelatinous remnants of the apple juice in the pot, then add a bit more juice and keep cooking. I like to put a flame deflector under the pot to keep it from burning on the bottom. Once the kumquats are done, let it cool down and put it in a clean glass jar and store in the refrigerator. I usually take one kumquat at a time and eat it slowly if I have a sore throat. Or, you can mash one up and add a little hot water for a tea. This is also great for singers, or anyone with dryness or throat irritation. You’ll soon be singing like a chickadee! This entry was posted in Cooking, Health, Remedies and tagged cooking, Kumquat, medicinal remedy, natural remedy, sore throat remedy by mycookinglifebypatty. Bookmark the permalink. Been cooking all my life and loving the way I can create big effects by creating delicious and healthy food. Most of the things I would want to say "about me" will be in my blogs! What a great idea, Patty! 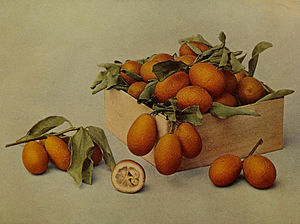 I am not sure how available kumquats are in our neck of the woods, but will have a look around. Thanks, Kathy! They seem to appear briefly around now and then disappear again. I found mine in a regular grocery store but not in my natural food store. This sounds really good Patty! It is and it really works. Thanks for commenting, Jack!